Carlo Gentile was an Italian who came to Victoria in 1862 and opened a shop selling fancy goods in February 1863. He quickly realized that shop-keeping was not for him. He sold off the goods and took up the profession of photography in October 1863. Despite the difficulties of using the wet collodion process which required that a glass plate be coated, sensitized, exposed and developed within twenty minutes or so, Gentile took his camera and darkroom out and beyond the studio. By the time he had left Victoria near the end of 1866, he had become the first photographer to make images in the Alberni Valley, Nanaimo, the Leech River Gold Rush, the Cowichan Valley, the Lake Route to the Cariboo, the Cariboo Road through the Fraser River Canyon to Quesnellemouth (now Quesnel). Only one other photographer is reported to have worked in Barkerville before Gentile arrived there in September 1865. 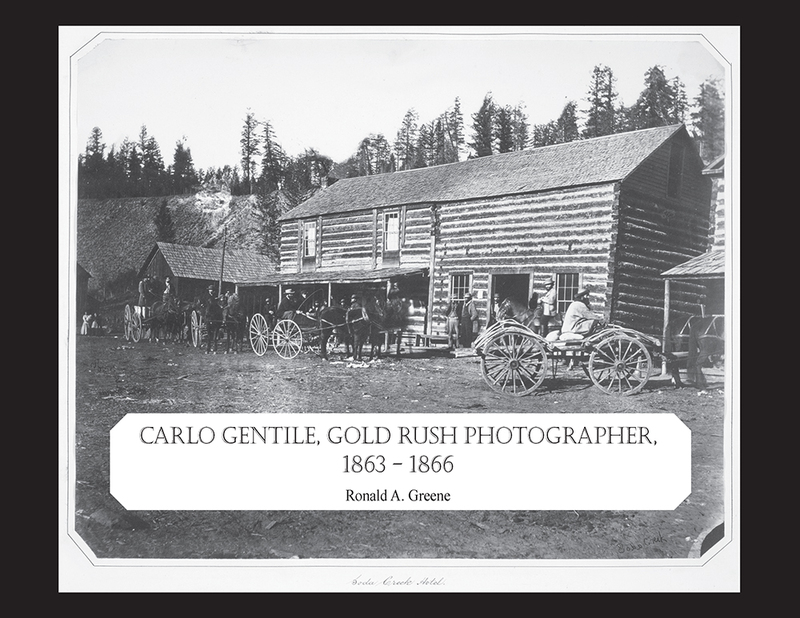 Gentile’s images of Barkerville, Cameronton, Richfield, and many of the gold claims on Williams Creek bring to life the conditions experienced by those hardy miners. There are also five images from Puget Sound (Washington Territory) which include the earliest known images of Seattle. Gentile was planning to take his glass plate negatives to Europe to print and sell the images there, but the negatives went missing in transit, so he moved to San Francisco instead, then to Arizona where he became famous for photographing the “Indians” in the 1870’s. We have included almost 140 images either signed by Gentile, or attributable to him, out of somewhat fewer than 300 different known images. They are reproduced life-size or larger, resulting in a 9 x 12 format, with acid-free paper and sewn binding designed to hold up for a hundred years. Some of the images are known from only one surviving photograph. Feedback from many of the initial purchasers includes the word “wonderful” for the book. Period maps and charts, and explanations of the images have been added. The book is designed to complement Cesare Marino’s biography of Gentile, The Remarkable Carlo Gentile, which included only a dozen pages on his British Columbia work. A limited number of hardcovers were also produced, for libraries or collectors. Please contact us for price and availability. If you wish to combine books in a single shipment please ask for a price quotation. If you wish to pay via PayPal, contact us with your order details and we will send an invoice. Payment may also be made by cheque. Click here for a mailing address.